Following up on the classic 1992 Bowman was no easy task. 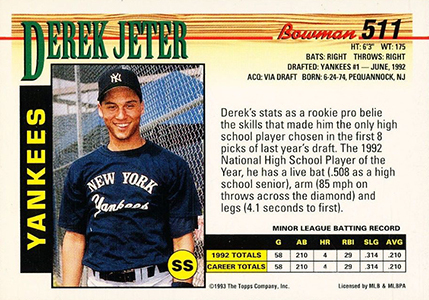 And while 1993 Bowman Baseball doesn't have nearly the same depth, it does have one of the better Derek Jeter rookie cards. The set is a large 708 cards. Cards fronts are fairly plain. Besides the white border, the only other design elements are a relatively large Bowman logo at the top and a nameplate that uses a Western-style font. Backs are a little busier. A second photo is joined by vital stats and a similar Western feel that is hinted at on the front. Stats for veterans break down to how they performed against specific teams. Rookies and young players have limited stats and a scouting report. Like 1992, the cards were considered premium for the time thanks to their glossy look and feel. 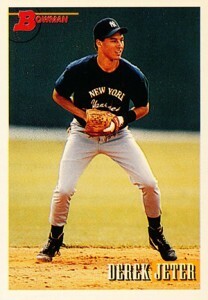 Jeter is by far the most important card in 1993 Bowman Baseball. However, it also has the lone Andy Pettitte rookie card as well as a popular second-year card of Mariano Rivera. 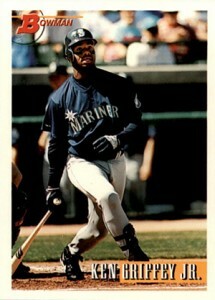 Other rookies in 1993 Bowman Baseball include Jason Kendall, Preston Wilson and John Valentin. 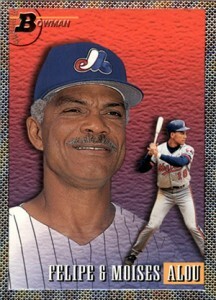 1993 Bowman Baseball continued with the foil subset. More than 60 base cards have a foil border. Among them are four father-son combinations highlighted on the same card. These were inserted one per 15-card regular pack and two per 22-card jumbo pack. 1993 Bowman Baseball boxes have 24 packs. Jumbo boxes come with 20 packs. 1993 DEREK JETER Bowman RC #511 BGS 9 MINT $FREE SHIP$ HOT! In my first pack I got the Jeter rookie and a Nigel Wilson foil, right when Nigel Wilson and David Nied were the hottest guys, in terms of cards. 1993 Bowman Sealed Hobby Box (24 Packs) - Fresh from Case - Possible Jeter RC?